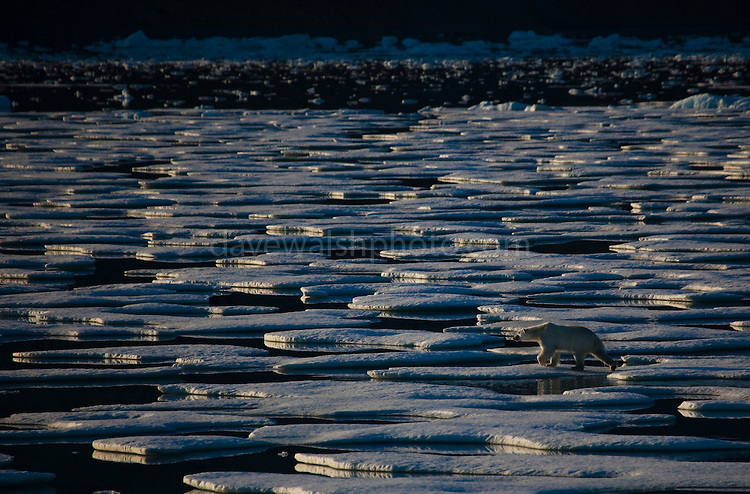 Nanuk: Polar Bear, Ursus Maritimus seen from the deck of the Arctic Sunrise in Kane Basin, North west Greenland. This sea ice - like much of what was in Kane Basin, was melted within a few days of this image being made. The bear's curiosity drew the ship while it was stationary, in sea ice, just after midnight on Sunday morning. It came very close to the ship, and even looked like it thought about trying to scale the side of the vessel, before playfully rolling about on the ice..This was fifth of six polar bears seen by the crew in the last few weeks. .The Greenpeace ship has been in the area for over a month, carrying out scientific research and bearing witness to the effects of climate change on the Arctic.